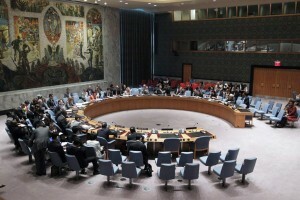 The CTC meeting, held at UN Headquarters in New York, was convened to provide Morocco with a platform to explain its unique approach to defusing extremism and countering incitement to terrorist acts – a methodology bound within the context of Islam and which the country has been sharing with national counterparts in West Africa. In an interview with UN Radio earlier in the day, Ahmed Toufik, Morocco’s Minister of Habous and Islamic Affairs, explained that terrorism exploits the failures and fractures within a society. In Morocco, he explained, the political bodies assisted the religious leaders by grounding all religious teachings within the ethics of moderation. “Those fundamentals are against terrorism because if you are Sunni, you can’t kill people because only God may judge their acts,” said Mr. Toufik. Jean-Paul Laborde, the Executive Director of the UN Counter-Terrorism Committee Executive Directorate (CTED), similarly highlighted the Moroccan example as one worthy of emulation. “Preventive measures are as important as the coercive ones,” Mr. Laborde said.